Today is the last calendar day of 2018. It's been quite the ride. It is also time to get back to work. I will finally open the Christmas cards that have arrived and write out my own. There is a reason my cards say "Season's Greetings" or "Happy Holidays". But after that? I need to begin writing out mailing labels and customs forms for the book orders. I know I could type them out and print them, but I sit at the computer far too much already. And I want to take the time to think of each person and in my own way thank them. It's a big ask to expect people to purchase a book, sight unseen. So I want to spend a little time appreciating these people who took the leap and purchased. Plus I don't want to get writer's cramp, so I will pace myself and do this over several days, in between weaving. 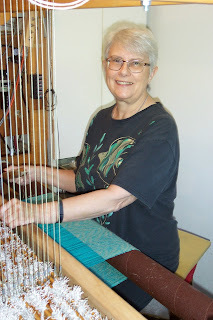 I'm getting close to finishing the current warp, the next has been crunched, plus I should hear shortly from Tien what she wants/needs done next for samples for her on-line class. I have 8 scarf warps wound ready to go into the Leclerc Fanny, plus I just ordered a huge amount of 2/8 cotton from Brassard which will arrive sometime in January once they are open again after the holidays. Conference planning continues. Some scheduling issues were caught and will be dealt with before we go live with registration. Always like to find these before we go live. Sending my best wishes to all for a productive new year. 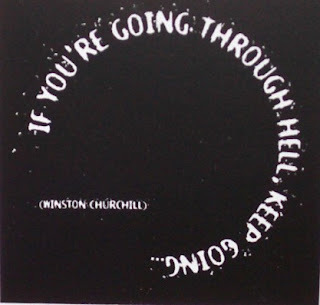 The current year is about to roll over into the new and many people are taking the time to pause, reflect, and generally sort out how their lives are going so they can figure out how to proceed into the new calendar year. My year begins with the solstice and the returning of the light so this exercise has been much on my mind of late,. I have a little book called A Grateful Heart with quotations from various sources and from time to time I will pick it up and open it randomly. you don't know that you don't know it. This is where a good teacher is invaluable. judge me when I got it wrong, but encouraged me to keep looking. Who lifted me up, not tore me down. I went wrong and how to do better. visual, kinetic. Still others can winkle out meaning from reading. We live in very interesting times with the rise of the internet. now have on line classes, dvds, chat groups. and come to conclusions. How to write with clarity. - if my posture and processes were good or would lead to injury. tried. And always - I learned. learning is not a competition. gone before. We help others become the best they can be. what you learn to achieve your goals. Then pass it on. That is how we keep this craft alive and vital. I don't 'do' resolutions for the coming new year, but thought I would share some on line resources for people who want to increase their knowledge in the coming year. 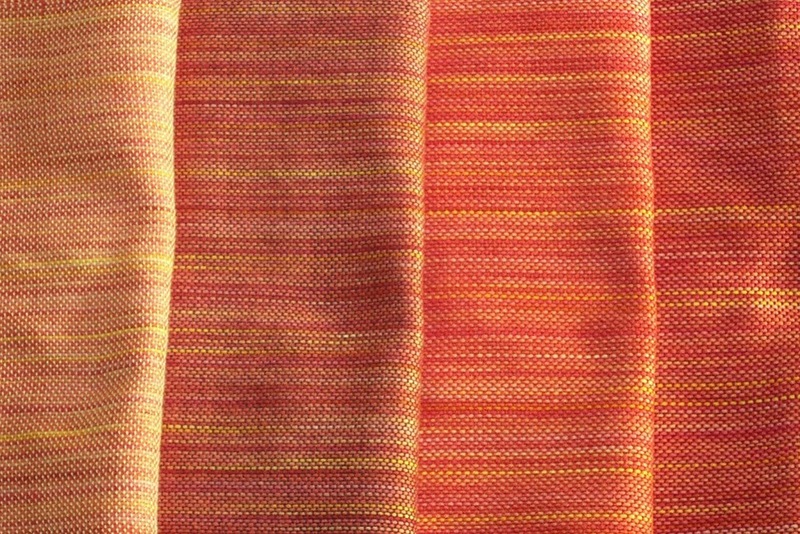 As some of you know, I have been weaving samples for Tien Chiu's on line course on colour for weavers. She has launched her first class which will begin shortly. You might want to check out her resources and consider if her class is right for you. She has been working on streamlining her website and will soon move the forums to a different platform which she hopes will be more user friendly. Jane Stafford's on-line guild is another resource people may find helpful. I've known Jane since the mid-1980s and she gives good straight forward information in a concise clear manner. 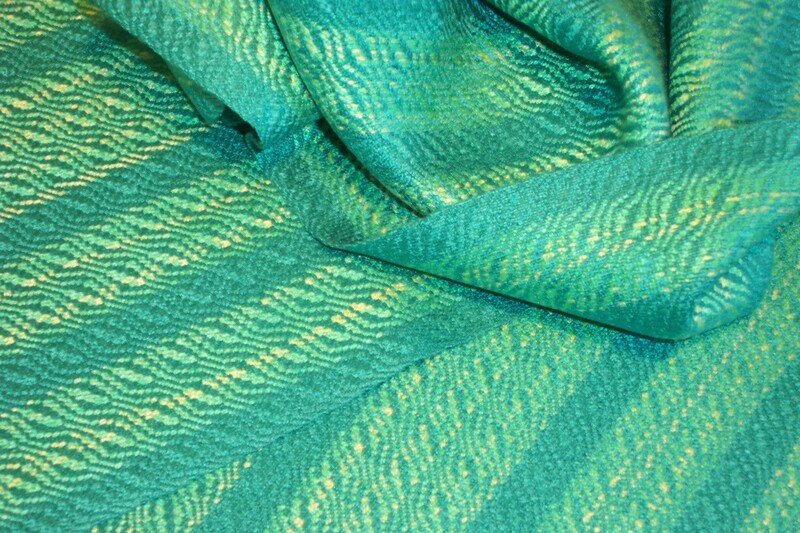 Janet Dawson's class on Craftsy is a basic class on learning the fundamentals of weaving. Just this morning she mentioned that she now has over 8000 students - something that shows people are becoming interested in weaving again. 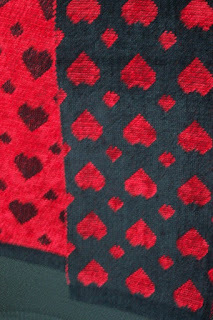 Recent articles say that hand weaving is having a resurgence. Something that makes me feel confident that the craft of hand weaving will continue for a long time to come. Heddlecraft is an on-line magazine by Robyn Spady. 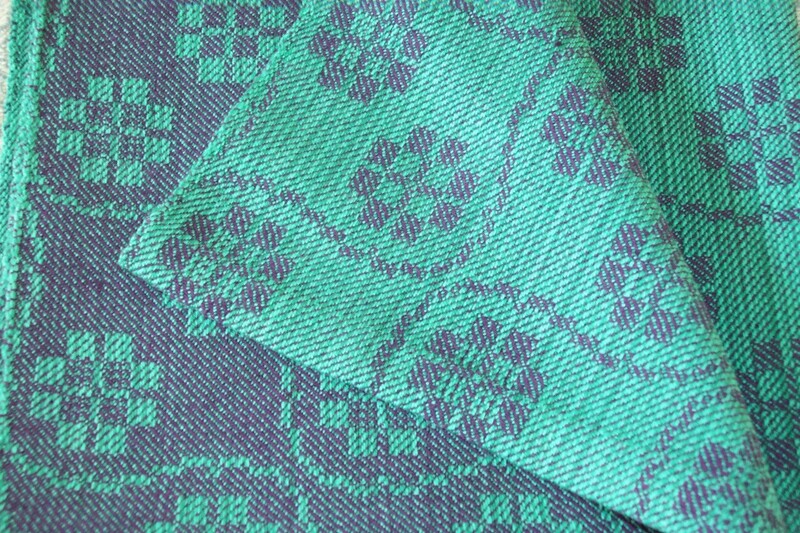 She covers one topic in depth per issue and includes .wif files for those with computer software for weaving. Interweave Press has now migrated much of their dvd inventory into 'classes' such as mine. 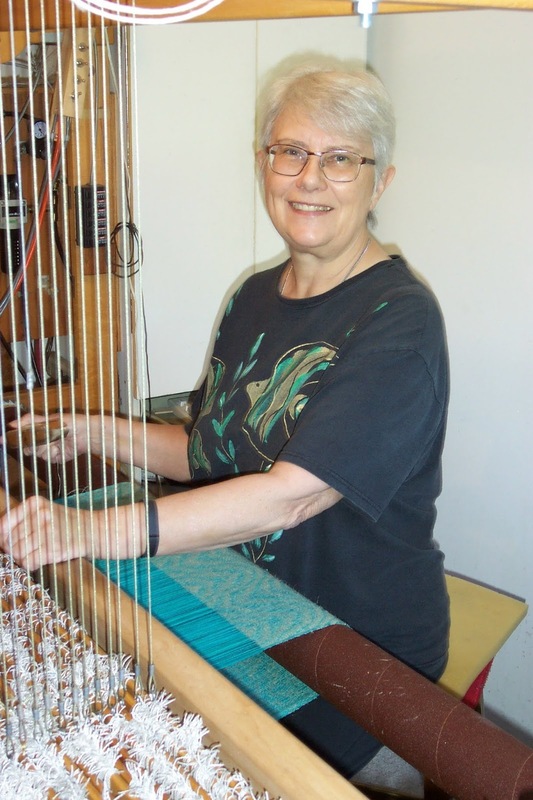 WeaveZine and WeaveCast were created by Syne Mitchell. Syne continues to fund the website so that people can access the articles and podcasts. These are just a few on line resources. Feel free to add more in the comments. Now that Christmas (and the introductory offer) is over, it is time to gear down for the long haul. My immediate schedule now switches to conference planning. We are very near to announcing the registration opening. If people haven't yet signed up for conference email notices, I urge you to do so asap as things are getting very near to being ready to go public. What I would ask is that anyone who feels this book is worthwhile? Could you please go to the page and click on the 'share' buttons? Marketing a self-published book is challenging because you find yourself constantly tooting your own horn. Which I am not too shy to do, but it helps people to know if the book is truly worth the purchase price and if they might find it helpful if others say so and not just my ego saying it is. We are getting some snow today and I have chosen to not go out but to have some quiet days this week in order to plunge back into what needs doing next. I reached the half way point in the current (30 yard) warp, I've used up three tubes of cottolin and am about to start the fourth and last in my stash. Yesterday I wound the first of the linen bobbins which are steeping in the humidor. And I crunched the numbers for the next warp, which will be a twill block version of Canadian Snowflake but in bright cheerful colours - the warp is Peacock and Emerald Green, the weft will be navy or turquoise single linen. 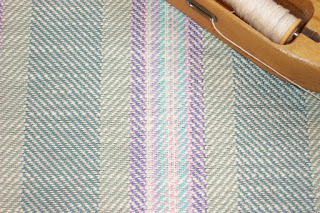 Of course I am once again weaving linen at the dryest season, so I will be putting the humidifier on in the next couple of days to try and make the linen behave better. If the relative humidity drops below around 40% I find that all fibres start to get cranky - even cotton will develop static electricity - linen and silk are even more prone to problems. A friend made and gifted me these a few years ago. They wound up in my teaching box - a perfect example of Summer and Winter and a fancy twill bookmark. 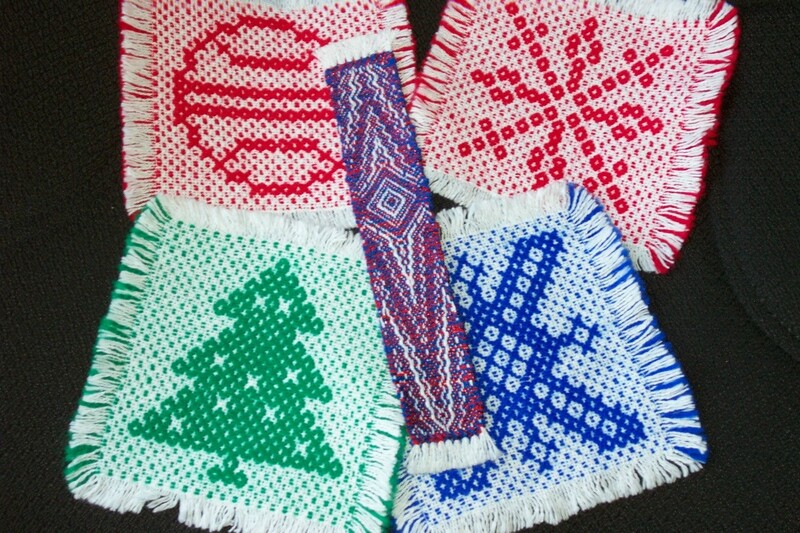 As a professional weaver, participating in the round of craft fairs that brought in a large percentage of my income for the year, by the time Christmas actually arrived I was exhausted. Or else I had critical deadlines early in the new year. There were many years when I spent several hours at the loom on Christmas day, either before or after spending a few hours with my brother and mother. Well, both of them are gone now and there are just the two of us. We have no plans for Christmas day, other than to veg. We have library books to read. I have a warp on the AVL and 10 or so scarf warps to go into the small loom. 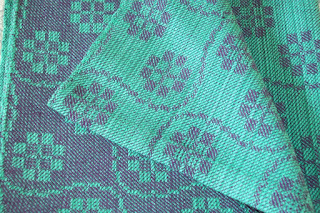 There will also be more weaving for Tien's colour class, but she is taking some time off after launching her on line class and spending time with her family. We agreed that my weaving the painted warp for her could easily wait until she is home from the holidays. So while I have weaving I want to do, there are no actual critical weaving/teaching deadlines I need to scramble to meet. There are a few pending orders to be dealt with - cheques held up in the mail, Paypal requests not yet paid. I've decided to wait until after Christmas to deal with the follow up emails. The orders are processed, a folder for books to be mailed in Canada, one for overseas, and several to the US. Orders are in alphabetical order and I'll begin with Canada and overseas and clear them out of the house first. While I'm waiting for the books to arrive, sometime in January according to the company, I will begin writing out mailing labels and customs forms. But all of that is going to wait, too, because I have cleared off the table and now have enough room I can make some jigsaw puzzles. It used to be holiday tradition that I would go for coffee each day and make puzzles with my friend. But she is gone now, too. So I am going to enjoy an Introvert's Christmas and stay home. Read. Weave. Make puzzles. Rest when necessary. I will begin on the conference again in the new year. But for now a very quiet, contemplative, Introvert's Christmas sounds perfect to me. Since getting home from San Jose, I have slowly been getting back to the loom, trying to build up muscle tone after not weaving much since early Oct. 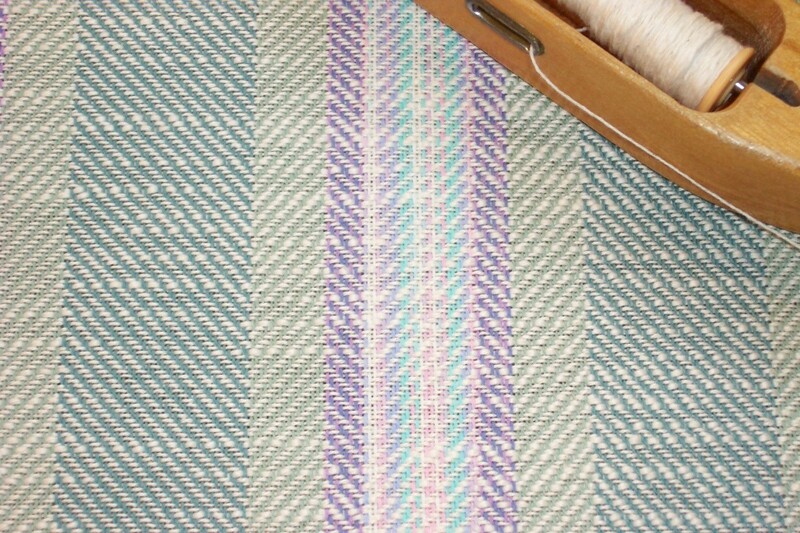 Even when I felt like weaving on the AVL, I didn't 'have much energy or focus, so while I did finally manage to finish the warp I'd left on it, it took a long time. Then the loom had to be dressed again and we were on the road doing craft fairs. There was just one week between getting home from Calgary and heading to San Jose, and all I managed to do was thread the loom. In between monitoring my email, the blurb website, processing orders, I have tried to get to the loom every day - although not always making it. However, I'm over a third of the way through the warp, finished two spools of cottolin for weft and started on the third colour today. A big project like writing and publishing a book is an exercise in riding the roller coaster of hitting one deadline crest, sliding down into the valley, then pushing upwards to the next. The introductory offer finished Friday at midnight and now the wait for the arrival of the books. I will do as much of the paperwork as possible before they arrive, but need to take a few days off. I'm thinking making a few small jigsaw puzzles might be just the thing to clear my mind for the next deadline crest. "I just received the hard-copy, (which has increased my knowledge in just the first chapter-the description of yarns is so succinct yet thorough.-and I have been spinning for some years). I know this is a treasure I plan to read from cover to cover (which I honestly don’t do with many weaving books). I would like to buy the PDF, but am not sure how to order it. (I ordered the book and Magic in the Water through Blurb). As Tien mentioned, I feel my little weaving room has been turned into a classroom, with you hovering somewhere close by. Thank you and many blessings for the coming year." Thank you Deborah - Happy Weaving! Now that the introductory offer for the book is over there is a bit of a lull before the actual books arrive so thoughts have returned to the conference. If people are interested in attending I strongly suggest signing up for email updates if you haven't already as important announcements will be forthcoming in the new year. We are very excited to present the ANWG conference in Prince George again. We did in in 1995 and here we are, holding it again. For those guilds who say they are too small to host a conference? If you have the facilities, you can do it! We are fortunate in having the Plaza with convention centre, library, art gallery and two major hotels all within a short walk of each other. We hope to utilize the plaza as well, but that will depend on the weather. The conference will take place in mid-June so people can enjoy our long summer days. Our weather is generally mild, but we suggest bringing layers. There are plenty of restaurants in all price ranges within a short walk, with food services at both hotels, the White Spot across the street alongside a Tim Horton's. But there are others nearby and well worth checking them out. Many are listed on the website with the tourism info. Do check out the website where there is information on the facilities and points of interest. If you have a spouse that enjoys hiking, there are walking trails within the city itself, but lots of trails within a relatively short drive of town. The Ancient Forest is a rare inland rain forest with trees estimated to be 1000 years old. The lower part is wheelchair accessible but the trail isn't terribly hard. Do stay on the walkways though to protect the forest floor. There are lots of rivers, streams and lakes for water sports like canoeing or kayaking or fishing. The Railway Museum has interesting artifacts (many collected or curated by my brother - just a little bragging! 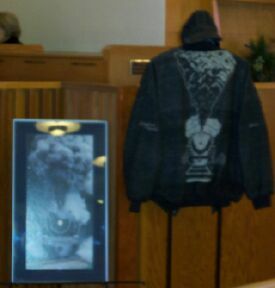 - I may ask to have the jacket I wove for him on display.) Exploration Place has interesting exhibits and the art gallery will host the teacher's exhibit in the Galleria. Forms for exhibits, fashions show and author signing are available on the website with a deadline of April 1 for the first two. Registration should go live sometime in January. By signing up for email updates, you will know as soon as it does. We can accommodate 500. I'm hopeful we will sell out. Stay tuned for updates! The introductory offer for The Intentional Weaver ended at midnight last night. The numbers are in. The order for the printed books has been sent. There is an anticipated date for the shipment to leave the printing facility. This project has been...interesting...especially when compared to self-publishing Magic in the Water. So much has changed since 2002 in terms of the technology available. The photos for the book were taken - almost entirely - with an iPhone. Seriously. The internet facilitated communication with the friends doing first the beta reading and editing comments, then updates from Ruth as her work progressed. But the biggest change of all is in the actual printing/publishing. This time I did not go to a local printer and arrange for the pages to be printed on an offset press, but Ruth worked her magic on the text/photos/diagrams and the file was sent electronically to the website and the books are printed far away and shipped. The website, which will now take over distribution of the book (almost) entirely will accept orders, print out on demand - if that's what the order is for - and ship. Apparently the company has facilities all over the place - I even found one in France with Magic in the Water offered with the listing en francais, but of course the text is in English. We also found a facility in Australia, most likely why they can offer such a low shipping price in comparison to my postage rate from Canada. People can choose to either purchase a printed on demand hard copy, or the PDF. They can also, if they wish, purchase Magic in the Water in the same format options. Since I am technically self-publishing, marketing will still be up to me, but since this book is targeted to a niche of a niche market, I figure I know my customers and am likely best equipped to address them. Now the fun bit begins. Getting the orders sorted, writing out the mailing labels, filling in the customs forms. Ordering boxes of padded envelopes. Then accepting the boxes (and boxes) of books when they arrive, filling the envelopes, affixing the labels, customs forms, getting them all down to the post office. We will work on this as quickly and efficiently (you wouldn't expect anything less from me, now would you?) and into the mail. From the bottom of my heart - thank you to all who ordered, both directly from me and through blurb. 2017 had been a bit of a...hard...year, for a number of reasons. On November 17, 2017 I was in the car, driving to the cancer clinic. I'd had a CT scan on Oct. 31, done Studio Fair Nov. 3-5, hopped in the van on the 6th, Doug and I driving helter-skelter to Vancouver, set up and done Circle Craft, then driven home on Nov. 13-14. Neither of those shows had been great and I was exhausted. When I got home the latest round of edits for the book had arrived and I'd been trying to distract myself from the upcoming appointment on the 17th by working through the manuscript - version 13 point whatever - and beginning to realize I just could not. It had grown too large for me to cope with. By the time the 17th rolled around, I couldn't deal with it, especially in the face of my certainty that the cancer was back. Even though the doctor had been very firm that it wasn't likely. If it wasn't back, then something else was going on and I at the very least wanted the elephant in the room ruled out. Because when you have what is rated an incurable cancer that will relapse? Everything becomes about wondering if it's back again. As I drove to the clinic the tears began to well in my eyes as I tried to think through what still needed doing and wondering where on earth I was going to find the energy and brain power. Especially with the conference organizing also beginning to ramp up. Once again I contemplated abandoning the manuscript and just letting it go. I had tried to ditch it several times previously but after a few months something would happen that would re-ignite the project and I'd begin working on it again. This time? This time I really thought the file was going to get dumped into the trash. But by this stage of the game, so many friends had invested so much into trying to help, it felt like a betrayal of their time, effort and energy. And so I wrestled with my emotions as I found a place to park and walked up the hill to the clinic. Suddenly a name popped into my head. "I wonder if Ruth would come on board as editor?" Ruth Temple that would be. I didn't know her very well, had only really 'met' on line, but we had shared friends and we'd friended each other on Facebook. I even had her email because we'd emailed over a project for one of those mutual friends so I contacted her. "Would you edit my manuscript?" I think I asked if she had the time to fit me into her schedule because I knew she did this as her profession and I didn't know what kind of queue she had. Then the tears really did come. So when I saw the doctor, I didn't cry when I was told that um, yes, I had been correct. The cancer was back. My remission was over. But now I had a lifeline. I sent Ruth the files I had been working with and asked her to tell me if I was wasting my time and hers. She assured me that I was not. My friends had also assured me I had something that needed to be said but by this point I needed someone else to tell me I had to continue. So many people had read very early embryonic versions of the manuscript in all it's raw status. How many was it going to take before I believed them? One more apparently. One more. In the end, the book took the better part of six years, in no small part due to my teaching/traveling/show schedule, but also because of illness - mine and my mom's - and the increasing fatigue that is a major symptom of so many things, including the type of cancer I have. By the time I contacted Ruth, I had come to the realization that I was way beyond my pay grade in terms of knowing how to get through the details of not just writing the content, but formatting such an ambitious project, and - last but not least - getting it onto the website to make it available to sell. All of the feedback from my student's questions in the classroom, but also from the people who read those prototype versions of the manuscript was poured into the text and it would not be the book it is without all of the help and support of those people. Some even went so far as to provide some examples of textiles because I was running out of time to get them done while I dealt with the adverse effects of the drug I take that makes it possible for me to live with cancer on a daily basis. "No man is an island, entire of itself; every man is a piece of the continent, a part of the main..." John Donne wrote a couple hundred years ago. I could not have done this without the help, encouragement and support of my friends and Doug. They lifted me up when I fell. I got by with a little (a LOT!) of help from my friends (and partner in life). One of the things I needed to learn when I became a weaver was to figure out how to weave to 'spec'. What does that mean? It means I had to weave to a certain quality - given specifications. At first those specifications were determined by me - I wanted a very particular quality of cloth. The first step was to clearly articulate what those qualities were. Then the challenge was to determine how to achieve those qualities. And that's when the sampling happened. 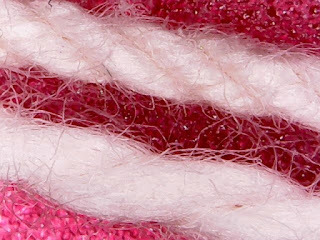 I would try a particular yarn, experiment with density, weave structure, wet finishing techniques. Yes, I wet finished the samples because until I did, the true nature of the cloth was still unknown. Over the years I also wove for others. In those instances I had to weave to their specifications. Sometimes they gave me all the details but then I had to meet their criteria. Along the way I also started the Guild of Canadian Weavers master weaver program. That entire program was weaving to spec - the program's specifications. The Olds master weaver program is also all about learning how to weave to spec. The Olds program is different from the GCW program in that students get in person instruction and strategies for how to learn how to weave to spec. Each program does approach weaving from the same intent, they just go about it differently. GCW is a testing program, Olds is a teaching program. My entire career I have spent trying to explain to weavers why they might want to approach weaving from this direction, but truthfully? Not everyone has to or needs to. However, what the craft needs to stay pertinent and vital is a core of people who do understand the craft at the level of being able to conceive, extrapolate, and articulate how to create textiles that will successfully serve their intended purpose. Recently there was an article about the resurgence of weaving as a craft. 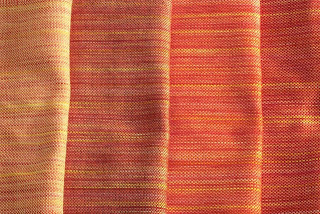 I started weaving just as the last resurgence began in the 1970s. Weaving is real estate hungry and budget hungry and not everyone wants to can afford to weave on a floor loom. But there are other options - rigid heddle looms, back strap looms, inkle looms. 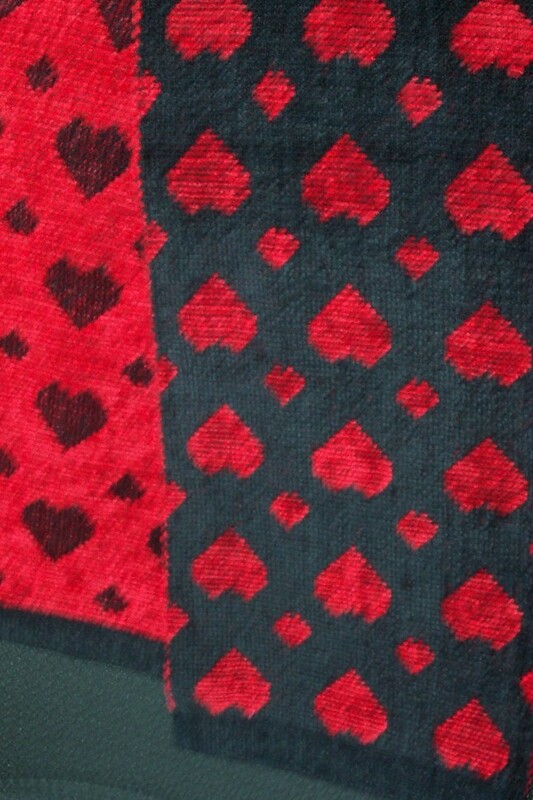 There are also techniques such as card weaving, finger weaving, and braiding. Even bobbin lace incorporates weaving - I call it weaving where you build your loom as you go and where warps can change into wefts and vice versa! I expect that the craft of weaving will continue for a very long time. My hope is that the students of the Olds program will continue on to teach, even if it is just one person, write, even if it is just blogs, design, even if it is just for their own enjoyment. But mostly my wish is that the knowledge of the bones of the craft will continue, on into the future. In our society we tend to measure success by how much we accumulate in tangible things. How much money we have. How big our house is. How expensive our clothing. It is one measure of success, but it is not the only one. When I quit my rather well paying job to become a weaver it was quite scary. Would I be able to earn enough money to pay for the mortgage, food, etc? I was fortunate in having a supportive spouse who literally supported me for a few years until I a) learned how to weave then b) learned how to sell what I made. Being a weaver in the 20th and 21st centuries is not the standard income model. Much of my learning was on how to best manage my finances. How to get the money coming in, and how to manage it going out. Eventually we had only the income from the studio - for nine years. Then it was back to working elsewhere for Doug while I figured out how to adjust to the changes in the marketplace and work on developing other income streams. Society is so far removed from people doing the 'traditional' crafts as their profession that I had ladies stroll by my craft fair booth, exclaiming "Oh, you're still weaving! Well, I guess it keeps you busy." Then strolling on. I had to smile (wanly) and agree that yes, indeed, it kept me 'busy'. They had no clue, none whatsoever. Eventually I developed the teaching and writing side of my business to the point that, after publishing Magic in the Water, I was away from home more than I was at home in 2004. I still call that my coast, to coast, to coast year. I started the year on Salt Spring Island, taught in Louisiana, Prince Edward Island and Cape Breton - and many points in between. My personal approach to 'success' has not been on the size of my bank balance, but if I could pay the bills that month. Could I fill the van with gas? Could I pay my VISA bill off? Could I buy a new bra? One day my mother-in-law came for a visit just as we were going out to meet my mother for lunch. About once a week mom would invite us out and buy us lunch. (She also loaned me her car - frequently.) When MIL and I were in the van going back to the house she commented that she wished she was rich like I was. Pardon? Well, you own your own business so you're rich. I burst out laughing and told her that - at the time - we were living below the poverty line. "Well (so and so) told me you're rich because you own your own business." I pointed out that in case she hadn't noticed it was my mother who had picked up the bill for lunch including hers. I told her that if you considered 'rich' being that I could take a couple of hours off work to have lunch with family, then yes, I was rich. If you counted the fact that I was doing work that I loved, then yes, I was rich. But if she counted 'rich' as having pots of money, then no, I most definitely was not rich. At a party one evening, I listened while two guys lamented how much they had to pay in taxes and all the tax 'dodges' they were utilizing to reduce their tax 'burden'. I finally got fed up and told them that I lived for the day I made enough money that I would have to pay taxes. And walked away. Paying taxes means that you have gone some way towards meeting society's definition of 'success' - you have earned enough so that you are no longer scraping by below the poverty line but are earning enough to contribute to society by way of your taxes. So am I 'poor'? Not really. I don't have as much money in the bank as if I'd stayed in a more secure profession. I've not had holidays to exotic places, nor do I have a fancy wardrobe. But I don't have debt, my mortgage was paid off as soon as we could possible manage it. I pay my taxes when I earn enough money to qualify. I want for little in terms of material goods. So am I 'rich'? I would say that I am. I have lived a lifetime of being creative, working in a field that has given me much satisfaction when things go right, and taught me even more when it didn't. I have been self-sufficient. I have even, whenever possible, helped others. My wealth may not be quantifiable. But that doesn't make it any less valuable to me. There were so many stations along the way when The Book began to feel 'really real'. But now this - finally - an actual book, hard cover, full colour, ISBN and all. It finally, truly, is...really actually real. When I decided to proceed with this project it was because I would not have to do the warehousing and shipping of the books. The website would take the orders, print the books out, ship them away to their new homes, pay me my share at the end of the month. And then I decided that - because I'm self-publishing - an introductory offer would be A Good Thing. Plus people wanted something immediately, not weeks later. People asked very nicely if they bought a printed copy directly from me, could they get a free PDF? People wanted something for their partner to have to open on Christmas day - even a thumb drive with the PDF on it would do. I reluctantly decided to present an introductory offer, time limited: purchase the hard bound actual printed out book directly from me, get it signed once I received the shipment from the printing company, plus get the PDF immediately. Which meant I had to order in actual 'really real' books, sign them (writer's cramp, carpal tunnel and all), find padded envelopes, fill out customs forms, schlep them all down to the post office. Well, I figured I might sell 50 or so, so why not. All y'all have far exceeded my expectations. As of yesterday morning, when last I counted, there were 170 paid orders. Since then more orders have come in. There are also about 20 in the pending pile, awaiting payment. Some have opted to send cheques, some (in Canada) e-transfers, some have had Paypal requests sent and just need to send me the money. As soon as I get payment and can process the paperwork, I send a link to the PDF in Dropbox (or Acrobat for those people having difficulty with Dropbox). People can download the file onto their computers/ipad, whatever. That file will go away, probably by Dec. 31 so if you have a link, do download the file. This is a limited time offer, which ends at midnight Dec. 21, 2018. After that the book in both PDF and print versions will be available from blurb (along with Magic in the Water, also both in PDF and print versions). I expect to have some copies of the print version available at the ANWG conference in my booth. I may have some Magic in the Water, print version as well as Weave a V (which I published for Kerstin Fro:berg and which is still available from me in North America - from her in Europe). Thank you to everyone who contacted me and those who purchased. Heart cockles very definitely warmed. I started this blog when I thought I was recovered from my recently diagnosed cardiac issues, not realizing that this kind of thing is never...healed...just managed. In Feb 2008 my brother, at the tender age of 51, fell over dead from a massive heart attack. When asked by the coroner if this was common in my family I replied that someone always seemed to be falling off their perch and I was advised to immediately get 'checked out'. I made an appointment with my family doctor who immediately put me on Lipitor (statins) and blood pressure medication. Unfortunately I appear to be either allergic to, or cannot tolerate, statins (the effect is the same - they make me deathly ill) and much adverse effects later, I found myself in March in emergency with not chest pains as such, but feeling like I had an elephant standing on my chest. I was incredibly fortunate in that my doctor sent me immediately (do not pass go, do not collect $200) to emergency. I was even more fortunate in that the attending doctor who saw me in emergency believed that I had cardiac issues and scheduled me for a stress test. Because the three times I went to emergency afterwards with feeling ill and chest 'pain'? I was told I was having a panic attack and not a heart attack. One doctor told me I had an esophageal problem, not a heart problem. In the end the stress test 'proved' I had cardiac blockages and on May 9, 2008 (our wedding anniversary as it happened) I was having stents installed. But! I had not (yet) had a heart attack. Life went on, and I carried on taking Lipitor feeling more and more ill until the day I could not force myself to take the two pills (I was on maximum dose at this point). Much angst followed with my doctor insisting I had to take some form of cholesterol reducing medication and every single one of them causing me all sorts of grief. Eventually I just flat out refused to take anything. As part of my 'recovery' after the angioplasty I saw the cardiac nurse and we went through a rather exhaustive questionnaire to determine if my lifestyle needed to be 'improved'. At the end the nurse sat there, tapping her pen on the desk, shook her head and said "You were doing everything right." Then why did I wind up here, I asked. She looked at me and said "You can't fight genetics." Several years followed and other health issues arrived (getting old is not for sissies) and suddenly I was once again having shortness of breath on exertion and fatigue. To be truthful the fatigue had never really gone away although it had been less for a while. But now it very suddenly was getting worse. I went from being able to walk up four flights of stairs in October to barely two in December. I requested a referral to a specialist but once again an ECG showed my heart was 'fine' - no sign of a heart attack. I insisted on the referral but since I seemed to be 'fine' there wasn't any particular hurry to get me in. Eventually I got an appointment and explained to the specialist what was going on only to be told I was getting old and out of shape. I pushed for a stress test based on my history of blockages and eventually I got the test. Which I failed entirely. No surprise to me - huge shock to the doctor. Instead of attending Complex Weavers, I was on the table in Vancouver having another angiogram, being told that yes, I have blockages but none of them were particularly 'bad'. The doctor at the bedside running the wires told me I was fine, there was one last test to run, then they'd get me ready to go home and I could carry on with my life because I was fine. Cue the test, which took all of a couple of seconds and then doctor says "Oooohhhh. You need by-pass surgery." I turned my head to look at him and said "That's not what I wanted to hear." He looked down at me and replied "No one does." I asked about stents and he said that the blockages were too close to junctions of main arteries and the stents would then block the main arteries and cause lots of problems. He said the blockages were ostial in nature (very close to a sharp bend) and therefore were acting as through they were much worse than the 60% blockage they were showing as. Surgery was my only option. They then referred me to a surgeon. I went home, looked up what 'ostial blockages' were so that I understood what was going on, looked up my surgeon and found out he was head of cardiac research at UBC, had pioneered a surgical procedure which would allow him to do the by-pass surgery without putting the patient on a heart-lung machine, and even though I would have to wait some months, decided to just take it easy and wait. When I was doing intake for the surgery, the anesthesiologist observed with some surprise that I had not had a heart attack. I told him I wanted to keep it that way. That I had a strong heart but crappy plumbing. He assured me that the surgeon was a very good plumber. The nurses I saw were all very supportive of my having the surgeon I did, every one of them saying he was very good, so I was glad I'd waited. The moral of the story is this: some people do not have the 'classic' heart disease symptoms. They don't always have the chest pain, the radiating pain down the left arm. They are not always unfit and living unhealthy lifestyles. Sometimes it is genetic and presents in other ways. I was having pretty 'classic' female cardiac symptoms, BUT SO WAS MY BROTHER. I am quite convinced that all those family members who died from massive cardiac issues all had the same ostial nature blockages, both the females and the males. My symptoms? Fatigue. Shortness of breath on exertion but also? My fingernails had turned a kind of lavender colour, even the whites. And so had my brothers - a thing I noticed the Christmas preceding his collapse at work. I am now taking a new medication that is not related to statins in any way. It is controlling my cholesterol levels and I am hoping that it will continue to work and not present me with any adverse effects beyond what I am currently having, which while annoying are livable. Not sure why this seemed important today but here it is. One of the ways I have 'survived' as a starving artist is to be very clear about what outcome I hope for, and what outcome I expect. The two are - at times - wildly divergent. I was disappointed so many times in my early years, hoping and expecting a show or project would be great. When it wasn't a great outcome, I would second guess myself and be disappointed. I learned to have high hopes but prepare for the 'worst' - whatever that meant in the context of the event. So when I ploughed ahead with The Book, I had hope that it would be of value to people and that it would be well received. What I expected? That eventually it would pay for itself. With my expectations firmly in the forefront of my mind I set up a system to track orders. I had a small filing box and as the orders came in I filed them alphabetically so that if there were questions I could easily find the orders. As the number of orders grew I set up two filing folders: A-M and N-Z. This morning I added a third folder. A-E, F-M and N-Z. I will also bring out a banker's box because those three folders will not fit into the small filing box. I did not expect there to be very many orders via blurb until after the introductory offer was complete. It has been with some amazement I have seen orders arrive in my blurb account. Some people are obviously taking advantage of ordering through blurb to also order Magic in the Water. I feel very humble this morning. And extremely grateful to the weaving community for the support they are showing for this effort. Orders are starting to taper off and I had no appointments today so I determined to finish setting up the AVL and at least weave one towel. It's been ages since I've woven and as a result, I've lost muscle tone. As with any physical activity, the best strategy is to begin slowly and re-build the strength I've lost over the past couple of months. These towels are destined for the shows in 2019. The first show is the Hospital Auxiliary conference in April. Next is the ANWG conference. Since I am taking a booth at the conference to sell The Book I figured I might as well have some tea towels. These are in the Snail's Trails and Cat's Paws design, a perennial favourite of weavers. I put 30 turns/yards on the beam with the goal of using up the cottolin in my stash. And then I (ahem) acquired 5 kilos of single 16s linen. The colours aren't great, but they will do for tea towels. So whatever warp is left once the cottolin is used up will be woven with the linen. One towel is woven and there is one tiny thing that needs fixing - one dent has only 3 ends while the next has 5. Now that I'm at the cut line I will fix that. If I weren't ending this warp with linen I'd probably not bother to fix it at all, but the linen won't shift as much as the cottolin will. Besides, that one dent that looks like a thread is missing (because it is) annoys and irritates me. I don't want to have it bug me for the whole 30 yards. What a roller coaster ride! Poor Ruth finally managed to wrestle the website to the ground and get the PDF version of the book up and running and lo! Here 'tis! Both versions are now officially available from blurb.ca. You can also get Magic in the Water - just scroll all the way down the page. Purchase the print version of the book - from me directly - and you will receive in the new year a signed copy of the book. You will also, upon payment, receive a link to collect the PDF from Dropbox. Yes, the entire file, not just a sample. Yes, I am actually giving it away, free, with the purchase of the print book. Truly. How do you place the order? Email me laura@laurafry.com and say you want to buy it and how you wish to pay for it. I will either send a Paypal request for $92.40 (in Canada which includes shipping and GST) or $88.00 which includes shipping for outside of Canada (but within the United States). If you want to pay with a VISA or Mastercard, we can make that happen, too. I bill in Canadian dollars and your card service will do the conversion to US$ on your statement just like Paypal does. For Canadians, I can also accept an e-transfer. Once I have received payment I will share a link for PDF file for you to download and put onto whatever platform you wish. I've been told it loads onto an iPad, both iBook and Kindle, without problems. Or download to your desktop. Or do both. The file will eventually go away so I suggest that if you want to keep the PDF on your devices download sooner rather than later. The sample print book was shipped today and I should receive it soon, hopefully in the next few days. I will have to commit to a print run very soon in order to get the books here by the end of January, so I hope that if you want a book you order sooner rather than later. The book can be purchased from blurb now, either print or PDF. I'm hoping people overseas will find the PDF version helpful because they don't have to pay expensive shipping. It has been really hard for me to think about anything other than launching this project. Now that it is, I need to focus on some other things. 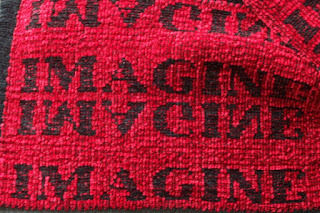 As you know I've been weaving samples for Tien Chiu's on line colour course One of the things that happened while I was down south was a meeting with Tien about my continuing involvement in that Big Project. It's all very exciting and very VERY challenging. I've been threatening to 'retire' for some years now and begun easing into a sort of 'semi' retirement, but staying involved helping someone younger than me with more energy than I have, but not enough time to do all that needs doing? I think that makes really good sense for the future. I was born and raised here near the 54th parallel and as such I have spent my life watching the sun come and go in the sky. Over the years the winter solstice has become a much more important day in the year to me than any other. The winter solstice is when the sun stops its slow slide to the horizon and begins its gentle journey back up, bringing with it our longer daylight hours. Humans seem to be bound to the sun and the moon in ways that we can't really articulate. Fire no doubt felt magical to early humans. It brought heat but also...light. Recently I had a conversation with someone about being supportive. My life has benefited in so many ways by others helping and being supportive of me. At one point I was feeling guilty after picking the brains of another weaver and apologized because I had no money to pay for her time. She looked at me - hard - and said "Pass it on." Her words sounded prophetic to me, as though I had suddenly found my calling. Pass it on. Be generous. Do not hoard your talents, your knowledge. Pass it on. When she said those words to me there was no internet - or at least not for the public. When I did join the internet and chat groups, I made a point of helping. In some ways I gave many hours away, hours that I could have spent making money for myself. But I remembered those words. So, when I was taking a break from trying to earn money, I would give back. Writing a book, two books, meant expenses above and beyond my time. While I would love to give the books away, I can't afford to do that. So yes, I am charging a price for them, but I have tried to make it as low as I can so that more people can afford it, not so low it will take 10 or 12 years to pay off those expenses. As part of the introductory offer, I am giving a free PDF. And that is truly a gift of thanks from me to those people who are willing to purchase the book pretty much sight unseen. Ruth has been sweating bullets trying to get the PDF only option live on blurb and reports that she's nearly got it ready. I hope that the book is useful/helpful to others who may be struggling. 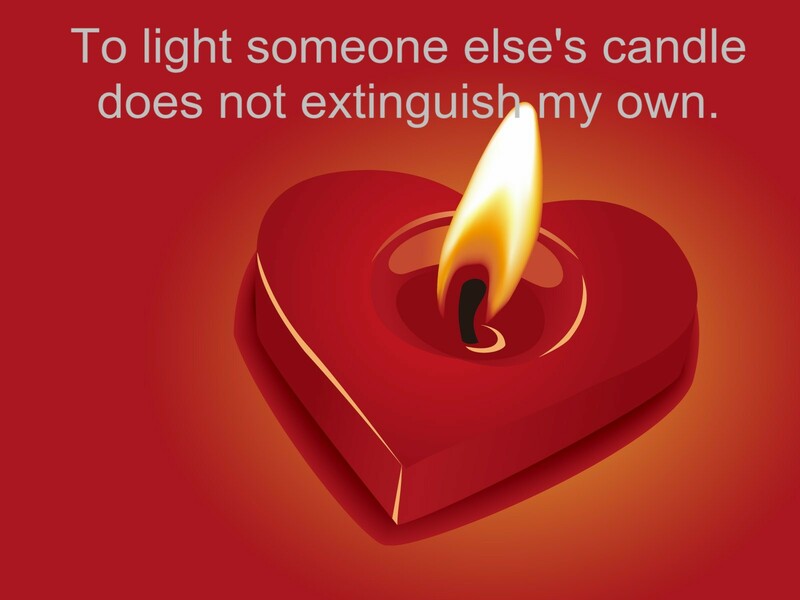 I hope that people can light their candle from mine. 10 days to the solstice. And the returning of the light. The sample print copy of the book should be ready tomorrow (be still my heart!) and hopefully it will arrive in a few days. I have now prepared an ad for the book and if anyone is interested in placing the ad in their guild newsletters, email me and I will send a Word document that can be used as is, or the information can be used as appropriate. The PDF that is being shared as part of the introductory offer includes the back cover of the book with two cover blurbs - one from Janet Dawson, the other from Syne Mitchell. On the technology front - the introductory offer PDF is available through Dropbox but two people have not been able to access the file that way so I have a work around. If this is the case for you, email me. In this age of the internet and social media, the ability to self-publish, I am relying heavily on the internet to get the word out. If you have questions? Email me. The answer to pretty much every question about the introductory offer? Email me. Ruth is still working on the PDF file for blurb, but that should be available in the next few days. Confession time. I'm a wee bit of a Luddite and don't really know or understand the technology, even though I think it's great - it's still a bit 'magical' to me! 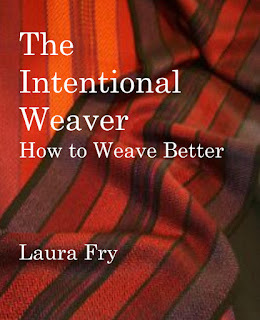 However I have been told that some people have not downloaded the complimentary PDF for the introductory offer of The Intentional Weaver but have been reading it on line. Which is all well and good, but that file will go away after the introductory offer closes so people really need to download the file to their desktop or whatever platform they want it on. Last night I went back to Dropbox and there is a 'download' button and when I poked it (again - I'd done it a couple of days ago but I wanted to make sure of it) the file downloaded in about 1 minute. Yes, it's a large file - about 39 mb. Thank you to all who have expressed interest. It was a bit nerve wracking to complete this project because one never really knows how it will go! The printer should be shipping my 'proof' copy on Dec. 11 and as soon as I approve it they will queue my book for printing. They say about 5-6 weeks so hopefully Canada Post will co-operate and I will be able to mail them out just as soon as I receive the shipment. Decks have been cleared (so to speak) and systems put in place to process the shipping of the books. If you want a copy on the introductory offer, and have emailed me but not received either a Paypal request or other communication, email me again. I have a couple of people who have not emailed but reached out in other ways which I have set aside until I have more time to deal with those but I have responded to all other emails that I have received. However last night someone mentioned on my Facebook time line that they had not heard anything so I asked if they would try again. This time the request did come through and has been dealt with. As soon as I receive payment I send out the link to the PDF. There are a few reasons I have taken this approach. With offering both print and PDF options via blurb *** it seemed like a nice way to introduce people to the book. 2. With the time lag between ordering and receiving the book, the receipt of the PDF is a stop gap until the 'real' book arrives. There are also a few reasons for having the PDF only option. 1. It's cheaper. No paper to pay for, no printing service to pay for. No shipping to pay for. 2. Some people are very happy to load books onto their portable devices - iPad, etc., don't want more physical books to store. 3. Overseas customers could just buy the PDF and save expensive international shipping. However, several people have requested a 'real' book and seem willing to pay the shipping. As soon as I get the sample book I will package, measure and weigh it and get a quote on shipping. It looks like it MIGHT qualify for small packet air rates, but I don't want to quote that until I can confirm it. And it won't be much longer - still well within the special offer time frame. So far I have three requests from outside North America. I will attempt to get quotes to those three as soon as I can. In the meantime I'd just like to say thank you to everyone who has ordered this introductory offering. I hope you find something of interest. If you do, I hope you will share that information with your friends. When someone self publishes, one of the things they need to do is the marketing. I will be doing a small 'ad' this week (busy with guild sale this weekend) and will be happy to forward to anyone who wants to put the 'ad' into their guild's newsletter or share on their social media. After being stuck in technology 'hell' for the better part of a week, we seem to have battled our way through the 'worst' of it. 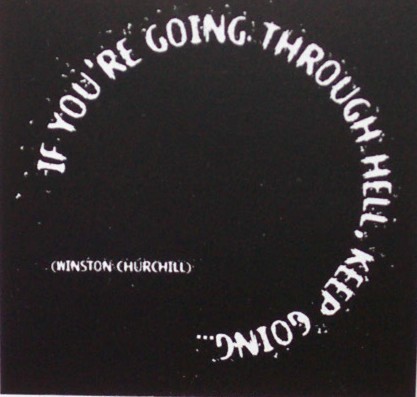 This quote from Churchill helped me carry on, because there was simply no point to flinging myself to the ground and flailing. The only way was forward, even if it felt at times more like a 'creep' than a 'march'. Talked with Ruth today who is still up to her ears helping Tien get her on-line class up and running but she promises to go poke at the PDF file on blurb by Monday. I wanted to offer a PDF version for those people overseas who would be faced with a huge shipping charge for a print book but could maybe just work with the cheaper option of downloading the PDF. So - I promise - it's coming! Over the week I've worked out a system to deal with the fact that the print copies won't get mailed out for a while. I needed a fool-proof system to make sure everyone who has paid gets a copy sent whenever I get them from the printer. At this point I'm waiting for the sample copy to approve before they roll the presses. It's not a cheap book to produce as there is colour on approximately 150 out of the 198 pages, including the awesome cover Ruth designed. But I felt if I was going to do this, it needed to be done 'properly'. And unlike people like Mary Black or Margaret Atwater, we have relatively cheap colour printing in this the 21st century. So colour it is. 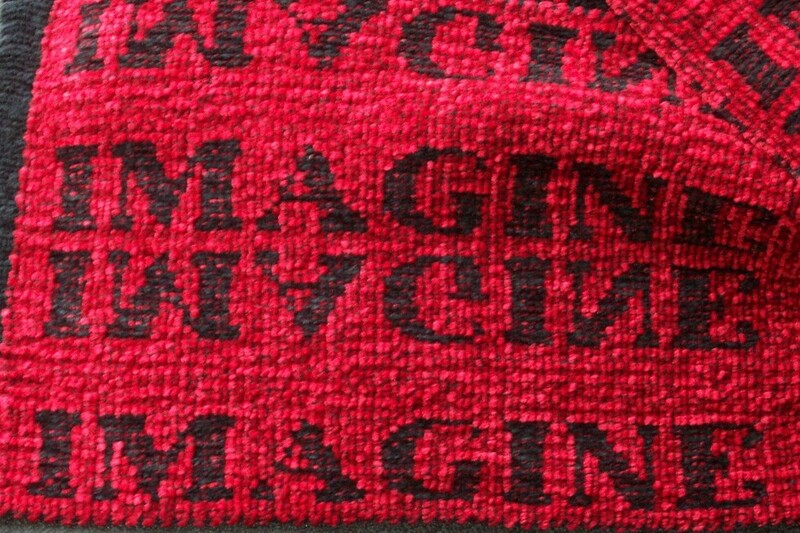 Given the median age of most weavers, the font size is decent - no squinting (hopefully!). The font is also one designed by a woman (name is forgotten but perhaps Ruth will chime in), which tickles my fancy, too. So the status of the orders is this: if you have paid you should have by now received a link to view the PDF. My four testers said they were able to download the file and load it onto several different platforms, so hopefully everyone will be able to complete that. I am about to file all the paid orders alphabetically to make answering any queries easier - I should be able to put fingers on the print out quickly that way. There are a few more people who have contacted me that I need to touch base with. If you are one of them, jog my memory if you don't hear from me soon. My inbox sometimes does weird things and I may have either not received your email or my inbox filed it someplace where I didn't notice. Believe me, even though I cleaned out my inbox as much as possible, I've had a boatload of emails over the past few days and things might have slipped past my radar. For those of you who took a leap of faith and ordered, thank you so much. If you like what you see I hope you will share with your friends. I will be putting together a promotional hand out over the next few days and would be happy to send once I get it done. Whatever made me think I could launch a book one weekend then immediately do another sale the following weekend? Many weavers have difficulty with putting colours together because sometimes they do unexpected things. Tien Chiu has developed an on-line course Color Courage for Weavers which has launched this week. She has a mini-workshop that is free and which will introduce people to the concepts she will be tackling in more depth in her workshop. My editor Ruth Temple has been juggling editing duties on my book as well as Tien's workshop and it has been a busy time for all. Yes, I am involved in Tien's workshop, too! 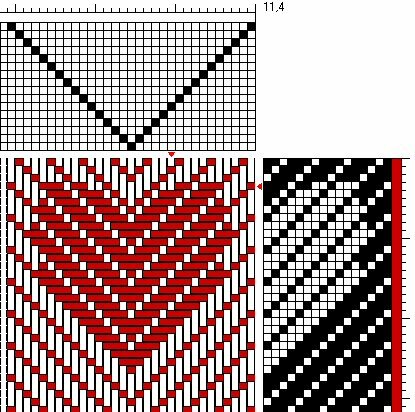 Last year I wove a lot (and by a lot I mean a LOT) of samples for Tien to illustrate what happens when weft crosses warp, how the interaction of colours changes when the ratio of each to the other changes when the weave structure changes. I am not an intuitive user of colour. What I know or understand about colour in cloth is based on years of trying (and sometimes failing) at putting colours together in a way that pleases my eye. 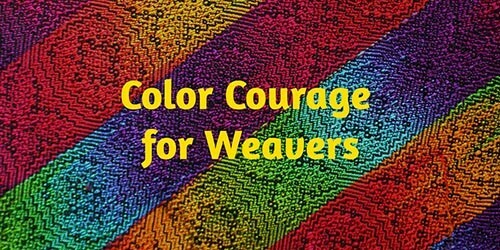 This course is the one I wish I'd had when I first started weaving. If anyone is feeling a bit insecure about how colour works in cloth but would like to know more in order to create their own unique textiles, I recommend enrolling in Tien's on-line workshop. Seems like with every step forward, I either slide one back, or at least to the side. I came home with a copy of the PDF version of The Intentional Weaver loaded on my iPad, thinking that all was well and I would be able to start sharing the link immediately with people. It hasn't worked out that way. The link opens perfectly in Google, but when I try to open it in Google docs to share? The file becomes corrupted. No cover. Page breaks not where they should be, throwing the entire document out of kilter. After a couple of hours last night and a couple more this afternoon (when I was supposedly fresher!) I cried uncle and asked for help from Ruth. Who is busy on another critical deadline on a project that is not mine but which I fully endorse. Since I am stymied on getting the PDF ready to share, I figured I could at the very least acknowledge the orders so far received and send out Paypal invoices for those who want to pay that way. So that is what I am now in the midst of doing. If there is one thing I have learned in this life it is that no road is perfectly straight or even smooth. One step forward, one back, side step, side step, hopefully forward again. This photo shows the difference between an 'ordinary' 2 ply cotton yarn and seine twine. They are both yarn. They are both cotton. But they are - quite obviously - not the same. Writing a book is one thing. Selling it is quite another. A couple of people have asked me if I'm happy now that the book is a real entity (it can be purchased from the website *** directly or from me on the special introductory offer I announced on Dec. 2). We are still trying to get the PDF version 'live' and Ruth will continue to work on that over the next few days and see if she can figure out what is happening that it won't go 'live' like the print version. So, am I happy? Not really. I would say 'relieved' rather than 'happy'. Because the next step is now up - that of getting the word out and - hopefully - selling lots and lots of copies. I got home this evening from San Jose after a very busy and stress inducing week of the final polish, re-reads, print out, re-read, polish some more, finally going 'live' on Sunday. We had some technical glitches with the website, but in the end Ruth got it done and uploaded. I'm hoping the PDF will soon be live, too, so that people outside of North America can purchase the book digitally and not have to pay huge shipping costs. When I published Magic, lo these many years ago, there really wasn't any kind of digital publishing happening - or at least not for small niche authors like myself. Ruth and I chatted about how much publishing has changed, just within our lifetimes. Me of the spirit duplicator/Gestetner stencil generation, she of the manual typesetting level of printing technology. We've come a long way, baby! At any rate, like I say, I only just rolled in the door this evening, travel weary, lack of sleep weary and stress weary. I have opted to not do anything with the order inquiries that have arrived while I have been in San Jose and returning home until tomorrow afternoon. So please be patient. I have to set up the mechanism of letting purchasers download the free PDF file, then I will be sending out Paypal invoices for those who have said Paypal works for them. Once the book is paid, I will email a link for people to download their file. The actual print books will take about 6 weeks or so - perhaps longer given the holiday season soon upon us - but at least buyers will have access to the book immediately via the PDF file. To those of you who have already ordered and paid - my grateful thanks. To those wanting more information or a Paypal invoice sent - tomorrow, I promise. If you missed the blog post with details, read the previous post. There are instructions about contacting me about ordering the special introductory offer, which is pretty simple: email me at laura@laurafry.com and I will send a Paypal invoice with the link for the free PDF. For those of you who shared the previous blog post, you are my 'spreading the word' angels. Thank you. Photo of working copy, with post it notes marking edits to be done. Seems mercury was in retrograde and after much thinking, additional editing (where we found more typos and minor formatting issues) and a last ditch ‘let’s try once more’ attempt to upload the manuscript...the website took the file (YAY!) and voila, we have A Book. We also have an Introductory Offer. 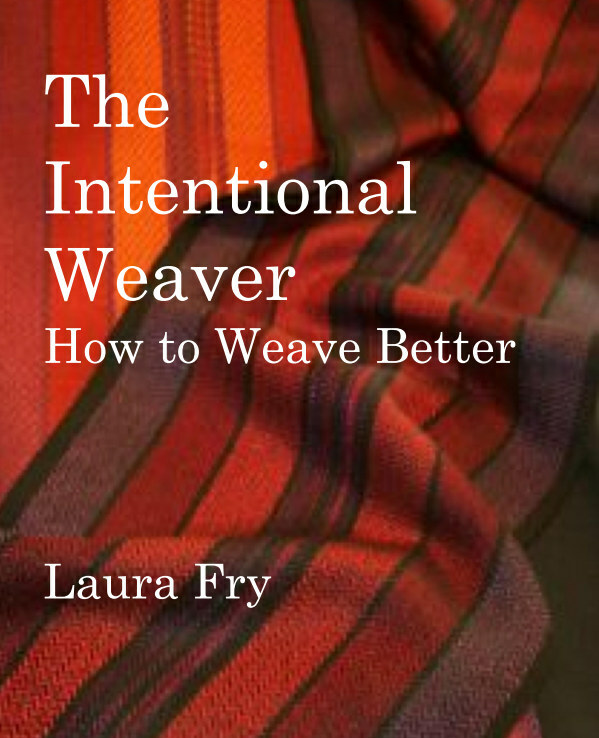 Until December 21, 2018 order a print copy of The Intentional Weaver by master weaver Laura Fry and receive a free PDF version of the book. Print copies will become available in the new year, but you will be able to download your PDF copy immediately. Books ordered directly from Laura on this introductory offer will be signed and mailed as soon as they are received from the printer around the end of January. A link to download your PDF version will be emailed upon receipt of payment. Price is $68.00 Canadian plus shipping of $20.00 anywhere in North America (plus GST of $4.40 will be applied for purchases in Canada for a total of $92.40). So everything was going pretty much as expected. Files were edited, fine tuned, corrections made, photos tweaked. By Friday afternoon, Ruth was about ready to make the appropriate PDFs and begin uploading the files to the website. From there on, things did not go smoothly. Ruth worked all afternoon trying to get the files to accurately load but there seemed to some kind of glitch in the upload. When she finally contacted support, it seems their business day was over and it was the weekend. We had thought to have the files safely and successfully loaded Friday afternoon, then test the files on Saturday at which point I would have the rest of the information needed to announce the introductory offer. Instead we are in limbo until Monday morning. However, we have the files. We are ready to offer The Intentional Weaver in print and PDF formats. I have an offer for those wanting signed print copies drafted and ready to announce. I just don’t yet have the actual book in the format we want it. I’m sure there is some minor issue that needs to be fixed but without the assistance of the websites support team we cannot go any further at this time.